Diabetes: Are you at risk? Let’s look at some facts about diabetes and then see how something as simple as eating a healthy lunch can help keep diabetes under control. Defined, DiabetesMellitus is a group of diseases characterized by high levels of blood glucose resulting from defects in insulin secretion, insulin action, or both. The common thread to all of these causes of diabetes is that they result in high levels of blood glucose. Just our sugar intake alone is enough to cause diabetes. Now, I know that most of you don’t consume large amounts of sugar; at least that’s what I’m told every time I ask for a show of hands of those that eat a lot of sugar. So how do we get these high levels of blood glucose? The USDA reports an average consumption of 130 lbs of sugar per person per year. That’s over 10 lbs per month or 4.5 cups per week or an alarming 33 teaspoons every day. Again, I’m sure none of you sit down with the sugar bowl and eat that much every day. However, you may be eating that much and not realize it because of the sugar we consume are hidden. 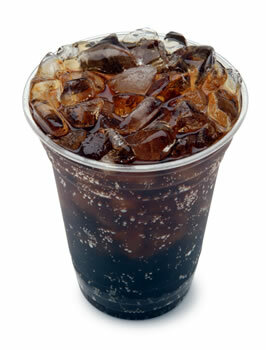 For instance, one can of soda contains 10 teaspoons of sugar. I have had many people tell me that they drink a few sodas a day. Sugar can also be hidden in your condiments. How about a little catsup for your fries? Sixty-three percent of the calories in catsup are from sugar. Take some time and look through your pantry and you can quickly see how it’s not that difficult to consume 130 pounds of sugar per year. Most of this sugar is highly processed and stripped of its essential nutrients, including those needed to digest and metabolize it. Because our diets contain an abundance of this processed sugar, our bodies have to react to this abnormally high load with a massive insulin response. The result of the insulin response is a significant dip in blood sugar levels which can lead to cravings that we satisfy with food; and the process begins again. Did you know … Our bodies only need the equivalent of 2 teaspoons of glucose at anyone time to function properly. Even if we didn’t eat any sugar our bodies are still capable of supplying the 2 teaspoons from other food sources. Diabetes was the seventh leading cause of death listed on US death certificates in 1996 and by 2002 it was listed as the sixth. An interesting fact about these numbers is that only 35% of those with diabetes had it listed on a death certificate as the cause of death, so these statistics are actually on the low side. So what can we do to reduce the amount of blood glucose? Let’s eat! But what? Well, we’ve all been told that we should eat a balance diet. Unfortunately, that is not enough. A USDA Food Consumption Survey revealed that 97% of the American population does not eat a balanced diet. Simply put, a balanced diet means that you are consuming complex carbohydrates, lean protein and healthy fat or put another way, glucose, amino acids and essential fatty acids. Common complex carbs are whole grains, brown rice and raw fruits and vegetables. Lean proteins are lean cuts of meat, fish and even some vegetables like spirulina. Healthy fats are found in nuts, seeds and avocados. If you are battling with diabetes, you should learn the glycemic value of all of your foods and stay away from the foods with high values. For more information on glycemic values go to www.glycemicindex.com. Loads of people have told me it’s impossible for them to pack a lunch and eat at the same time every day. I completely understand that it is more difficult for some of you … business meetings, deadlines and the lack of quality restaurants close to your work can make it hard. But if your life depended on it, you could make it happen. The statistics that I just showed you are telling you that your life does depend on it. .. at least the quality of your life, if not now then in the future. What those people are really saying is that they just don’t make their health the priority it should be. It takes me very little time to put a couple of pieces of fruit in a container, some of the brown rice left over from last night’s meal in another container and some of last night’s chicken into another. In fact, I bet I can do that faster than you can pick up the phone to order your lunch and have it delivered. And when you pack your own you don’t have to worry about whether the restaurant got your order right. Think about this fact: We only crave when we are hungry. Be consistent with your food portions and eating time to keep your cravings under control; more importantly to keep your blood glucose under control. What do you do if you order out or are at a restaurant for a business lunch? Always start your meal with something raw. Order a starter salad or better yet just have a big salad as your meal. Raw food contain the enzymes required to break the food down. If you believe you need protein with your meal then have them put a piece of fish or chicken on your salad. Think about all that sugar before you reach for the salad dressing! Oil, vinegar and lemon make a good dressing. Stay away from the white flour bread they bring to the table. Aske them for whole grain bread or just tell them to take it away. When a bread basket is available the content has a mysterious way of ending up on your plate. Thinking pasta? Make sure it’s from a whole grain… if its white, chances are it’s processed. Same goes for rice; brown rice is the better choice and wild rice is even better. Keep it simple, the closer a food is to the way it appears in nature, the better. Finally, if you are going to eat something cooked, be responsible and add the enzymes back by taking supplemental enzymes – Windhawk Balanced Naturals Enzyme & Probiotic Formula.